12/07/09 UPDATE: I'd have used this for seven weeks now and unfortunately, I have run out. I noticed a subtle change in the crows feet. 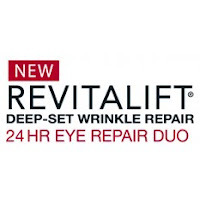 I've been using L'Oréal® Paris Revitalift® Deep-Set Wrinkle 24HR Eye Repair Duo for four weeks now and as part of my participation with BzzAgent, I want to share my results. I'm attaching pictures at two weeks and the bottom set is four weeks to see the results. Eight weeks is the optimal usage to start seeing results. 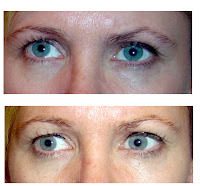 Now you may not be able to see the results without looking hard and if you do look hard, you will see that I need to get my brows done :(. After blowing up the pictures, I can see a diminishing of wrinkles in the crow's feet area which makes me happy. I want to see more results in that area as well as lower in the laugh lines. We'll see what eight weeks has to offer. If you don't know anything about this product, it's a two in one treatment for the eyes providing 24 hour treatment with SPF 15. You apply small dots around your eyes and gently smooth in. L'Oreal offers a video on expert advice HERE. The formula, made with Pro Retinol A, helps to repair broken skin fibers and smooth out the surface of deep-set eye wrinkles. It is clinically proven to visibly reduce the appearance of deep-set wrinkles, leaving you with younger-looking eyes. 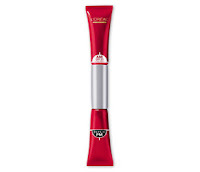 Want to read more about the product, go to L'Oreal HERE.